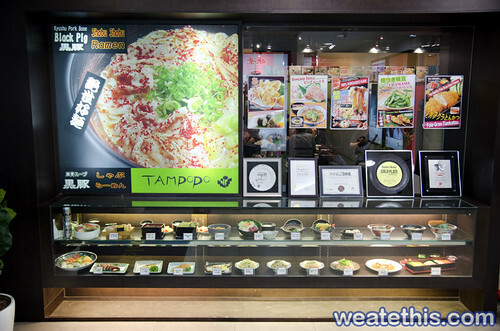 All their food looks fantastic, smells gorgeous and made me salivate profusely – but my mission was simple – I was at Tampopo to eat the Black Pig Shabu Ramen as I’d heard so much about it. The place is pretty easy to find, it’s on the ground floor and you can probably spot the queue from a mile away. As mentioned, this is a busy, popular and well-known eating house and except to wait. From my experience the turn-over time is pretty fast so even during busy period you won’t have to wait an unbearably long time. 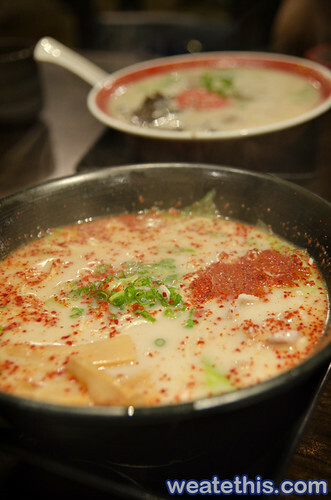 And well I was only there to eat one thing – Black Pig Shabu Ramen – it arrived at the table fairly quickly, steaming hot and smelling heavenly. 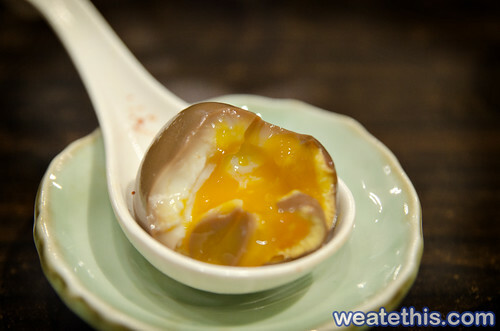 It’s one of the few things I’ve eaten that TOTALLY lived up to the hype, in a way it was an ephinany for me. I’ve never really ‘got’ ramen and the whole hoohaa about it – it’s just some kind of expensive Japanese instant noodles no? And well yes it had been for me, up until this point. It’s like the first time you eat freshly handmade pasta – you can really taste the difference, it’s a completely different experience. That almost reminds me that I’m sad Fasta Pasta closed down…but that’s another story. The noodles are springy and have some bite to them, almost like perfectly boiled al dente pasta – it was quite different from any ramen experiences I’d had previously. It was absolutely fantastic, even though I’m not a HUGE ramen fan I have to say this is the best I’ve had by FAR and the hanjuka egg was absolutely divine. 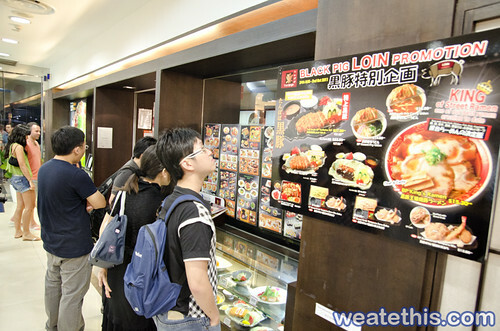 I will be trying some other recommended ramen places in Singapore next time I’m down there as it seems to be very high quality over there. I miss it…and I’m hungry now. So tell me, where are your favourite ramen place in KL? 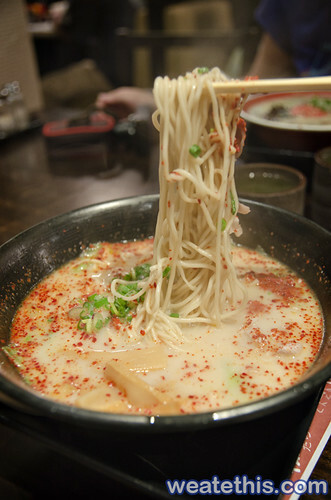 WE loved the ramen at Tampopo and I’ll definitely go back, we give it a yummylicious We Ate This 9/10. Location on Google Maps (Itâ€™s at Liang Court). Yah it’s been a while, over 2 year in fact – since we’ve updated this site. Hopefully, we are back now! 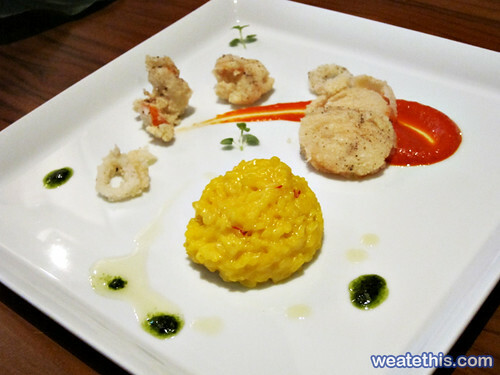 We got invited to Favola restaurant at Le Meridien, KL Sentral recently for a cooking demonstration by Chef Fabrizio from the The Westin, Beijing Financial Street. I really enjoyed his natural, simple way of cooking authentic Italian food with high quality produce and good technique. He really let the taste of the ingredients be at the forefront of the dish without over-seasoning. It’s refreshing to see when most Italian food in KL is a horrible mash of cheap olive oil, canned tomato and over-cooked pasta. 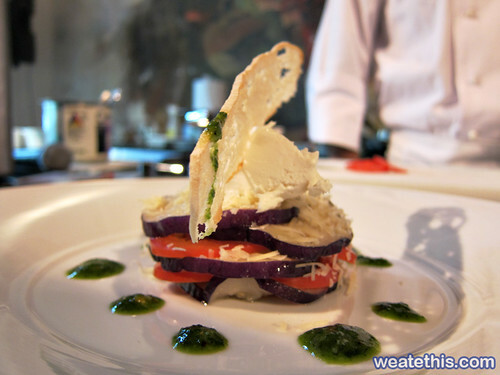 We got to see him create a delicate tomato and eggplant millefeuille. The deep-fried aubergine really gave it an alluring texture alongside the tartness of the tomato. A lobster and cherry tomato spaghetti, this is a really simple, elegant and tasty dish. Again using the small, fresh tomatoes allows the lobster to remain the star of the dish without getting coated in sauce. And a seafood risotto, I learned something new here – the seafood was deep fried in semolina! It gives it a wonderful, grainy texture without being overpowering. Favola serves some really good Italian food, I love their wood fire baked pizza – awesome! 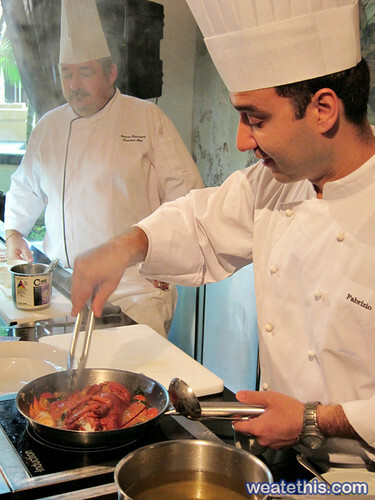 You can check out Inspiring Italy at Le Meridien, Kuala Lumpur from the 4th until the 12th of June 2011. Location on Google Maps (It’s at KL Sentral). Yes we do go The Curve very often, and yes we do try new places sometimes! I have tried The Apartment long long ago when it first launched and found it not so great, but not long back I had a function there and the food was actually really good (especially the mussels!). The staff used to have a terrible reputation for service too, but glad to say they are have improved a lot too. So we decided to give it a try, they have a few English treats too which tickled my fancy. And well it’s fast becoming one of our favourite places in The Curve to dine. The interior is simple, nice and clean. Somewhat reminiscent of an English kitchen. The drinks are a little pricey and they’ve stopped serving normal water, only mineral water now. They do have a good range of beers though and their juices are nice. But well, this is what we really go there for – the chicken liver pate! Just make sure you peel the layer of wax/fat off the top first, don’t try and eat it 🙂 It’s served with plenty of bread and onion marmalade. And our favourite of all – the Mussels, all the styles are great but this is “Apartment Style” which we love, slightly sweet, spicy and very garlicy. I have to say though we’ve been there about 5-6 times and the quality of the mussels has varied from SUPERB to just ‘ok’. It’s never been bad, but they have been slightly over-cooked. This may seem like an odd combo, but it’s quite delicious – the duck and mango salad. The desserts are pretty good, the Pavlova is a favourite of mine – but it’s very rich. Make sure you share it. It’s definitely worth a go, especially if you like pate and mussels served with a mountain of fresh bread. I think it’s a great place to chat, eat and share some food amongst friends. All in all we give it a We Ate This 7/10, if they could make the cooking of the mussels more consistent and the drinks cheaper (and give free water PLEASE) it could easily be an 8/10. Location on Wikimapia (It’s in the Curve). Once again I was invited to the delectable Friday Wine Lunch by Pernod Ricard @ Kannichikan Yakiniku with Jacob’s Creek (thanks Yik Peng!). You might remember last time it was @ Chinoz on the Park with Wyndham Estate. An interesting concept this time, Japanese influenced Korean BBQ. Who says the Japanese and the Koreans can’t get along? I guess food solves all conflicts? The location was Jalan Damai, Ampang (if you know where Rahsia is, it’s on the same road just off Jalan Ampang). The turn-out was quite good and the interior was nice and spacious and clean! The food was coupled with sparkling wine this time starting out with the Jacob’s Creek Sparkling Chardonnay Pinot Noir. The starter was Edamame, Morokyo (mixed vege), Tofu Salad & Gyu Tataki (slice roasted beef). This is a restaurant I frequent quite often and have done for some time, it’s quite a unique place serving some proper typical Teow Chew food and a favourite of ours which is the Mee Sua Tow. There’s a branch in SS2 near Lobsterman, that’s the first one I went to – but nowadays I tend to frequent the one in Aman Suria (or Sunway Mas depending who you ask) more often as it’s near my office and next door to the most awesome Char Siew in the world! The interior is simple and clean.